Sales expert Jill Konrath offers powerful strategies for sales proficiency in ever-changing situations. When sales people are promoted, change jobs, or face new business environments, they inevitably need to learn new skills quickly. This rapid change is often overwhelming, and sellers face an intense pressure from their bosses to deliver immediate results. Their livelihoods are totally dependent on their ability to get up to speed quickly. Sales guru Jill Konrath offers both new and experienced salespeople a plan for rapidly absorbing new information and mastering new skills by becoming agile sellers. Readers will learn the mindsets, learning strategies and habits that they can use in crazy-busy times to start strong and stay nimble. From time management tools to personal motivation, creativity, and gamification strategies, Konrath teaches sellers how to get more done in less time, regardless of the environment. To succeed in today's sales world, having go-to systems for rapid information and skill acquisition isn't only useful, but absolutely required. Konrath focuses on the meta-skills that will get sellers to high levels of sales and proficiency - and ultimately mastery - much faster than their usual methods. 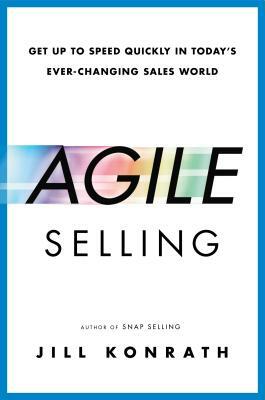 Readers who loved the no-nonsense advice in SNAP Selling and Selling to Big Companies will find Agile Selling equally valuable. Jill Konrath is a sales strategist whose clients include IBM, Microsoft, Accenture, Staples, Hilton, and numerous midmarket firms. She's a frequent speaker at sales conferences and kick-off meetings. Her previous books include Selling to Big Companies (one of Fortune's "Must Reads" for sellers) and SNAP Selling. Over 100,000 people read her weekly sales newsletter. "Chapters on how to absorb new information at a fast pace are worth the price of the book…Showcasing tools and techniques that can shift sales thinking and results, Konrath highlights the path to sales success."